We have a useful collection of number templates here, featuring the numbers 0 to 9. Use them to make displays, or cut them out of colourful card or paper and laminate for hands on activities. How about making a set from craft foam to play with in the bath? 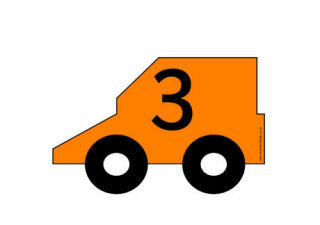 And of course these number templates can be useful for all sorts of craft activities too. Looking for number templates? We've got you covered! These number templates are just a little quirky, which make them especially good for crafts, collages and displays - where they add a certain liveliness! Here are our quirky, fun number templates in a smaller size - perfect for crafts, labelling, brightening up displays or for "hands on" numbers for the kids. Two numbers print on one page in this small set of number templates. We have UK, US and alternate number templates available so that you can find exactly what you need here.